Wingspan summer camps offer high quality instruction, time for self directed projects, support and room to experiment. Confidence building and life skills are also cultivated in an environment that provides mistake making safety and ample outdoor time each day. 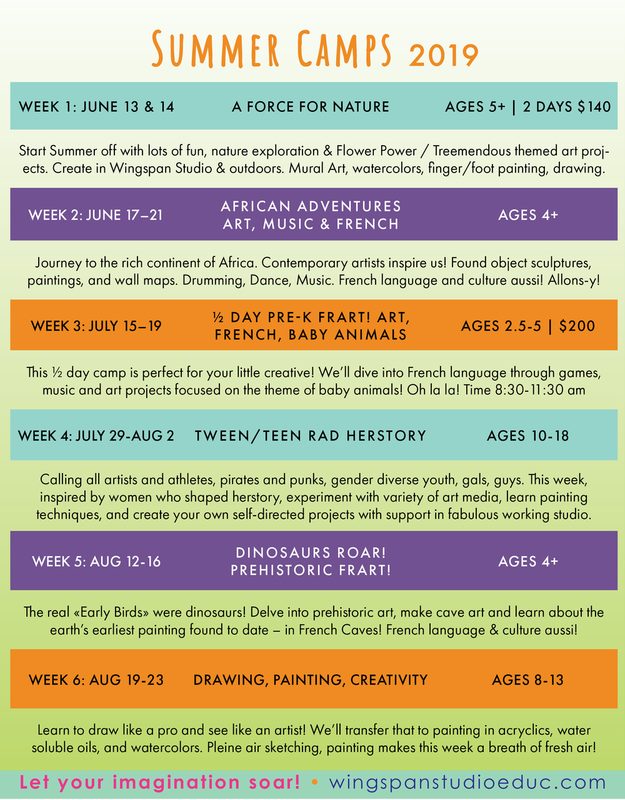 This interdisciplinary lens, while weaving the wonders of art, French and the natural world together, reaches all kinds of learners and we welcome all youth and their families! Register Now! Rated 5-Stars by Vermont parents. Read our Rave Reviews on Find and Go Seek! Vermont’s stellar insider guide to family/kid fun. Led by professional artist, fluent French speaker and longtime educator, Maggie Standley. Wingspan campers partake in the day-to-day running of an authentic working artists’ atelier. We’re located in Burlington’s funky and vibrant Arts & Industry Enterprise District. Wingspan Studio is in a renovated former bristle brush factory with large windows and high ceilings! Surrounded by other working studios, craftspeople and industrial small enterprises, campers have the opportunity to visit with and learn from this vast network of creatives. Studio time is coupled with much outside time too in nearby parks, studio visits and industry exploration. Allons-y! READ WINGSPAN'S CONSISTENT 5-STAR PARENT REVIEWS ON FIND & GO SEEK! You can register your child online or print the registration and mail it to us. If you have questions, please call (802) 233-7676 or send a message via our contact form. Wingspan is a multi-faceted working fine art studio, boutique school specializing in the arts and French language/culture, as well as a community development organization. Founded my Maggie Standley, fine artist, educator and community activist, Wingspan is the anchor for community mural projects, youth empowerment programs, school vacation camps and fine art.